Aquatint taken from 'Ten Views in the Island of Antigua', by William Clark. 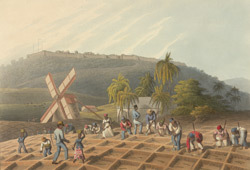 The aquatint depicts a group of enslaved people planting sugar cane on Bodkin's estate. The slaves - men, women and children, are working in the field together. They would have worked from 6 in the morning until 6 in the evening, with just a short break for lunch. This was arduous work and they were watched by a master or overseer, seen here wearing a black hat and holding a whip. The whip would have been used to drive them to work harder. The painting is set looking south from Bodkin's Estate and in the background can be seen Monks Hill Military Station. Also known as George Fort, this fortification took 16 years to build (1689-1705) and was intended to defend Falmouth, then Antigua's main town, from attacks by both the French and the Arawaks. The entire population of the island (about 1200 people at that time) could be accommodated inside, although it was intended to be a place of refuge for women and children.